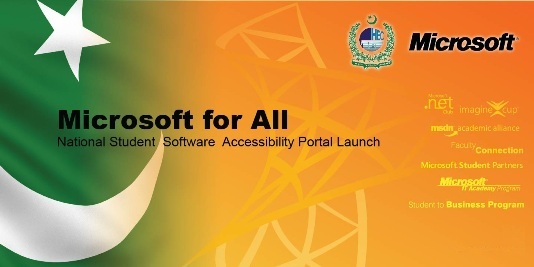 Punjab University IT center is providing NSSA (National Student Software Accessibility) Web Portal services with Collaboration of HEC & Microsoft to all Faculty Staff and Students of the University. The entire Faculty and Students of Punjab University will now be able to get Microsoft software catalog FREE OF COST through NSSA Web Portal. NSSA is a web-based management system which enables you to make MSDNAA (Microsoft Software Developers Network Academic Alliance) software easily available to your students and faculty. In other way, this is your University's software distribution website. You can register & download available software. IT Centre has created accounts for all faculty staff. You will get an email from “University of the Punjab - Information Technology Centre [noreply@e-academy.com]” having subject An Account has been created for you for registration. There will be a link in that email, using that you will be able to get registered by providing your basic personal information and new password. Punjab University’s Students who are Interested in creating NSSA web portal account are requested to send their valid email ID’s through their Head of the Departments/Faculty members to itcentre@pu.edu.pk via Email. You will get an email from “University of the Punjab - Information Technology Centre [noreply@e-academy.com]” having subject An Account has been created for you for registration. There will be a link in that email, using that you will be able to get registered by providing your basic personal information and new password. All the HoD’s/faculty members are requested to communicate the list of email addresses(Preferably in excel sheet) of interested students through their official mailing address. After registration you will be able to download any available Microsoft Software from that website free of cost by clicking on START SHOPPING. Please note that the software provided on this site is made available exclusively through an agreement between your academic institution and selected software publishers.